Only one friend comes to mind, who absolutely won't fling her heels (shoes) when out. I had a "GLAMOROUS" 30th birthday party in Vermont a few years ago, I begged her to fling her shoes, like the rest of my fabulously dressed guests including myself ... "Relax you're in my house!" Only to be introduced to her motto, "If I left my home in my shoes, they are not coming off." She is so serious that when she was pregnant, she still wore her heels. She went into labor with her heels! LOL! 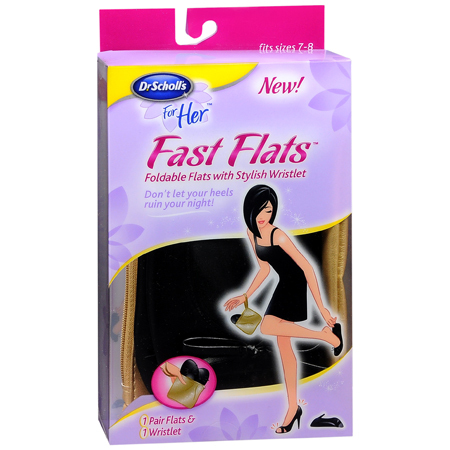 Dr. Scholl's For Her Fast Flats are a stylish and practical solution for times when you just can't bear to take another step in your heels. Let's face it ... after a while, enough is enough! These foldable, rollable, and stylish flats are so compact. Each pair comes with its very own chic wristlet for stylish transportation. You can carry the wristlet wherever you go! Perfect for nights out, weddings, traveling through airports, commutes and more! So go ahead and rock your most fabulous heels, knowing at any time you can kick 'em off and slip into your Fast Flats. Now there's no excuse to call it an early night! ... And no more black and dirty soles!